I could tell you about breaking my leg in the wilderness and lying on the ground for two days waiting to be rescued. I could tell you about when the school thug/bully promised he would kill me because I was dating his former girlfriend. I could tell you about being in some alpine caves and having a panic attack inside the cave, 300 feet from the entrance to the cave. I could tell you about leading seven friends up Broken Hand Mountain and all of us nearly dying of hypothermia when we got caught in a summer storm. But one of the most frightening moments of my life was far more pedestrian than those. About 15 years ago I had been out of ministry for a couple of years in order to rebuild and restore my marriage. I dared to attempt to interview for a pastor position down in Alamosa. I drove down from Poncha Springs where I was staying with my father. I got to Alamosa early and went to a coffee shop where I prayed. The devil was screaming in my ear that I didn’t belong in ministry. That I was a loser. That ministry would finish off my marriage. That I was washed up and useless to God. I sat in that coffee shop waiting, as if for my execution, with every muscle taut. My legs were bouncing. My tongue was cotton-mouth dry. My heart was racing. I couldn’t breathe. It felt like a piano was sitting right in the middle of my chest. I couldn’t make spit to talk. To shorten the story, the interview went well. The little church said they wanted me to be their next pastor. I went home, and Lynette and I prayed and finally decided the best thing for our family was to withdraw my name as a candidate. Turns out that was the right decision, but I’ll never forget that intense moment of fear waiting to go to that interview in Alamosa. What is the most frightened you have ever been? What has caused your knees to buckle? Do you know what the top fears are in our country? On most lists you might find, fear of death hovers right around number five and the number one fear in America is typically the fear of public speaking. So, let me get this straight, some of you would reading this blog would rather die than do what I do week in and week out? One strategy I was told in speech class to help with being nervous in a talk was to imagine your audience sitting in their underwear. As a pastor, I want to assure you that I have never done that. I never will! Being intimidated by an audience, or scared by a spider, or battling the fear of rejection can be debilitating. It can cause us to run for cover. It can cause us to make poor decisions. What do we do when we are faced with an overwhelming fear? When you read the ancient story found in 1 Samuel 17, you discover a conversation between the brothers and Saul, all of them had a Goliath-centered view of what was going on. Only David had a God-centered view of the situation—only David managed to see God. There is an interesting word usage in the David and Goliath story that I want to show you. And there came out from the camp of the Philistines a champion named Goliath. The word “champion” is a Hebrew word that means the man in between. It is used to describe someone who is a representative fighter. The champion is a brother of the tribe; often the captain of the army and sometimes even the king. And he fights on behalf of the rest of his people. Who should be Israel’s champion? Saul should be Israel’s champion, but he is doing his best imitation of Don Knotts hiding in his tent. So, here David, the least of his brothers, comes out to face Goliath as the captain of his people and eventually the king. This is a three-thousand-year-old picture of the victory that you and I will have fought for us by the Son of David on the cross of Calvary. Jesus faced down the ultimate giants that have haunted mankind since we were kicked out of Eden. The giants of sin and death. And Jesus didn’t face them at the risk of his life, but at the cost of his life. Only when you have your eyes on Jesus—your brother, captain, and king—can you actually deal with your giants. At the end of the first of the Lord of the Rings movies there is a powerful scene. Boromir is the son of the Steward of Gondor. He has strong ambitions to be the next king. But he knows this will only happen if he gets his hands on the one ring that Frodo is carrying and can take it back to Gondor. Boromir tries to take the ring by force and in the struggle Frodo slips the magic ring on his finger and disappears leaving Boromir flailing about. It is here Boromir’s rage and passion dissipate and he “comes to himself” only to realize that he has failed the temptation to resist the seduction of the ring. He weeps and is filled with shame and regret. Meanwhile Frodo and the ring are gone. Suddenly other hobbits in the fellowship are in danger and Boromir rises to fulfill his heroic calling by defending the lesser characters to the death. As he lies dying the once and future king—the true king of Middle Earth, Aragorn, rushes to his aid and fights off the Orcs and goblins. 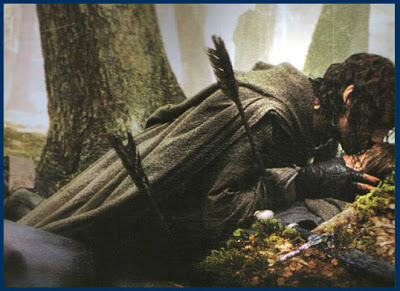 When he has won the field, Aragorn kneels down to lend comfort to the mortally wounded Boromir. It is my prayer that as you face whatever giants await you that you will open the door of deep faith to Jesus your deliverer—your brother, captain, and King. This entry was posted in Uncategorized and tagged Christian maturity, faith, Fears, Goliath, hope, King David, spiritual formation. Bookmark the permalink. Much needed. Will revisit your encouragement again tomorrow. Got a giant heading my way… well … he’s already here.